Sutton-on-the-Forest is a village and civil parish in the Hambleton district of North Yorkshire, England. 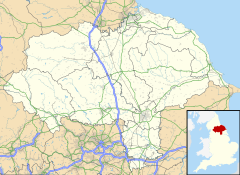 It is 8 miles (13 km) north of York and 4.4 miles (7 km) south-east of Easingwold. The village is mentioned three times in the Domesday Book as Sudtune in the Bulford hundred. At the time of the Norman invasion the land was split between the manors of Easingwold and Caldenesche. Therefore, there were several lordships including Earl Morcar, Gospatric, son of Arnketil, Uthred, Egelfride and Ligulf. Afterweards, all the land was claimed by the Crown. During the reign of Henry I, some land was granted to Bertram de Bulmer of Sheriff Hutton and the lands then passed through the descent of the Nevill family. In the 15th century a settlement was made between the Nevill's and Lord Fauconberg to whom the manor passed. The land then passed to Richard, Earl of Warwick until 1471 when it became forfeit and granted to Richard, Duke of Gloucester, later to be King Richard III. Upon taking the throne the lands were maintained by royal bailiffs. In 1629, the manor was sold to the citizens of London while its status was decided. By 1649 the manor was granted to Lord Fauconberg of Newburgh whose family held it up to the 18th century when it was acquired by the Harland family. In 1863 the manor passed to Admiral Duncombe who had married into the family. From 1738 until 1759, the novelist Laurence Sterne was the Anglican vicar of Sutton. He retired from active ministry to pursue his literary career in 1759, writing the first two volumes of his novel Tristram Shandy while living in the village. The origin of the name is derived from the combination of the Old English words "sud" and "tun", which combined mean "South Farm". The suffix relates to the village's location in the ancient Royal Forest of Galtres. From 1941 to 1946, the RAF operated an air field on the outskirts of the village. It was part of 4 Group, Bomber Command and originally had RAF Squadrons, but then transferred the site to bombers from the RCAF. The village lies within the Thirsk and Malton UK Parliament constituency. It is within the Stillington electoral division of North Yorkshire and the Huby and Sutton District ward of Hambleton District Council within which it lies. The nearest settlements are Huby 1.1 miles (1.8 km) to the north west and Stillington 2 miles (3.2 km) to the north. The area is still largely agricultural. The village has a public house and a pub/restaurant. There are two caravan parks on the outskirts of the village. Both located near the Green Park Business Centre on Goose Lane. The Green Park Business Centre houses small to medium size enterprises as does the various industrialist units on Carr Lane. The village is served by the bus route between York and Easingwold. Sutton-on-the-Forest CE Primary School is located on Main Street and is within the catchment area of Easingwold School for secondary education. The church in the village is dedicated to All Hallows and was completely rebuilt in 1877 on the site of the original 13th-century building. It is a Grade II Listed building. A Wesleyan Chapel was built in the village in 1864. The Primitive Methodists also built a chapel in the village in 1861. Both are no longer in use. Laurence Sterne – Parish Vicar (1734–1768), author of Tristram Shandy written whilst living in the village. William Charles Harland – City of Durham MP (1832–1841), resident at Sutton Hall. Arthur Duncombe Esq. – Howdenshire MP (1885–1892), resident at Sutton Hall. Katherine Downes, (born 1982-3), BBC TV presenter was married in All Hallows Church in the village. Sutton Park is a Grade I Listed building built of mellow brick by Thomas Atkinson. The House contains 18th century furniture, paintings mostly from Buckingham House, now Buckingham Palace, and a collection of porcelain. There is also plaster work by Cortese. The House is an example of early Georgian architecture overlooking landscaped parkland. Each year the village celebrates its countryside heritage in the Huby and Sutton show in Sutton Park. ^ UK Census (2011). "Local Area Report – Sutton-on-the-Forest Parish (1170216931)". Nomis. Office for National Statistics. Retrieved 11 June 2018. ^ Sutton-on-the-Forest in the Domesday Book. Retrieved 29 January 2013. ^ a b c d "History". Retrieved 29 January 2013. ^ a b c d e Bulmer's Topography, History and Directory (Private and Commercial) of North Yorkshire 1890. S&N Publishing. 1890. pp. 805–806. ISBN 1-86150-299-0. ^ "Topynomy". Retrieved 30 January 2013. ^ "RAF East Moor". Retrieved 30 January 2013. ^ "2001 UK Census". Retrieved 9 December 2012. ^ "Economy". Retrieved 30 January 2013. ^ "Primary SChool". Archived from the original on 23 November 2012. Retrieved 30 January 2013. ^ "Secondary admission arrangements for the Northallerton area". North Yorkshire County Council. North Yorkshire County Council. Retrieved 6 December 2017. ^ "Church Listing". Retrieved 30 January 2013. ^ "Sutton Hall Listing". Retrieved 30 January 2013. Wikimedia Commons has media related to Sutton-on-the-Forest. This page was last edited on 6 March 2019, at 17:40 (UTC).